Water is all around us. In the third component of the Young Scientist Series, teachers learn how to guide children in deepening their understanding of liquids, and water, in particular. Teachers begin by preparing themselves and their classroom for investigations ranging from experimenting at the water table to exploring water in nature. Next, teachers hone their ability to guide children's open and focused explorations of water and its properties, and learn how to best observe, assess, and document learning. 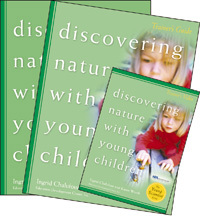 Four detailed chapters help children learn important science inquiry skills including questioning, investigating, discussing, and formulating ideas and theories. Take an in-depth look at the Discovering Nature with this video that includes eight real-life vignettes of the curriculum in use in the classroom. You can introduce children to the wonders of science with Discovering Nature With Young Children, a nationally field-tested curriculum funded partly by the National Science Foundation. Rather than focusing on learning facts without direct experience or observing random objects on a table, Discovering Nature makes science the exploration of materials and phenomena. It then gives children opportunities to learn from that experience.